A week ago or so, Hope was off for a week visiting old friends. So, along with the youngest, we took the opportunity to throw some pieces of meat on the smoker that we cannot do when Hope is around. These types of meat would be those that fall into the "Too Cute to Eat" category. Our first experimentation was with a smoked duck. Duck, cooked perfectly, is a treat. 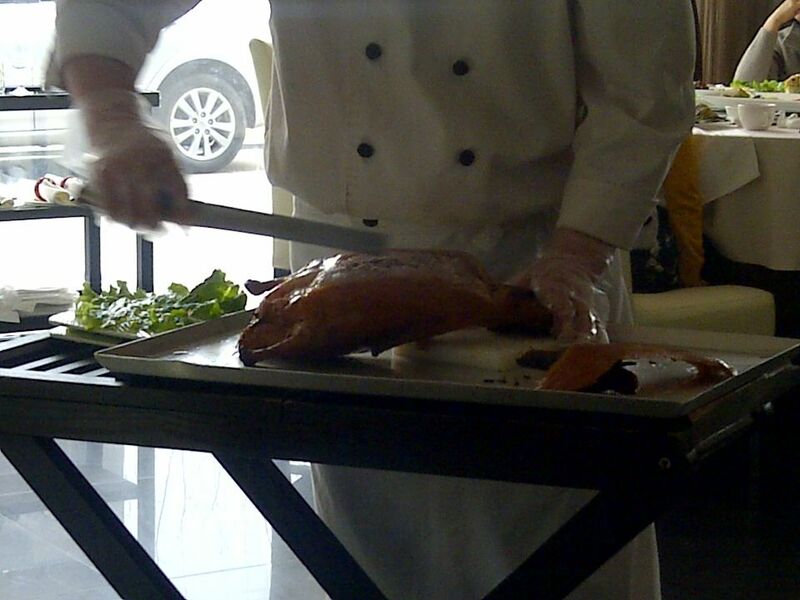 The best duck I have ever had was at a restaurant in Beijing that specialized in Peking Duck. Roasted to perfection, juicy on the inside, crispy on the outside, and sliced thin. Served with steamed buns, vegetables, and dipping sauces, it is a culinary delight. 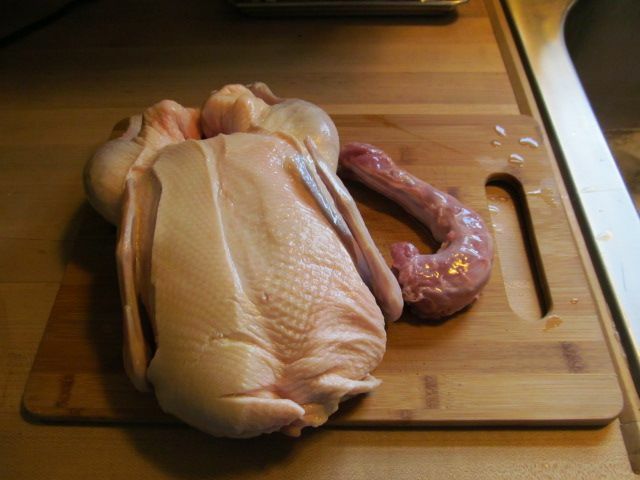 So, off to the store for a nice, farm raised duck. 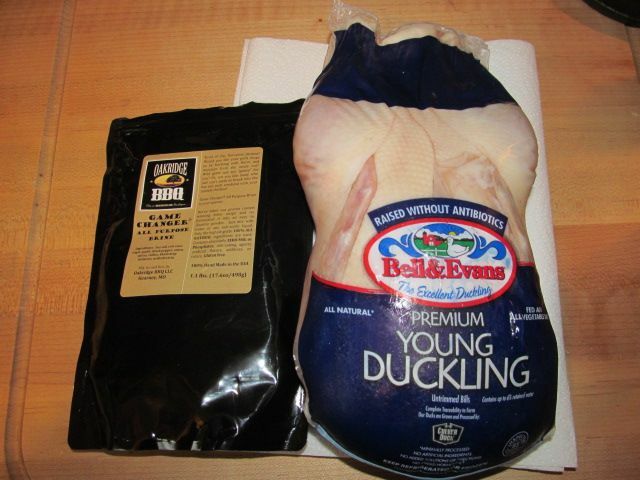 I took the young duckling out of the package, removed the neck and liver from the cavity, rinsed well, patted dry, then placed into a batch of Oakridge Game Changer Brine for a six hour swim. After the brining, I rinsed the duck and patted dry. 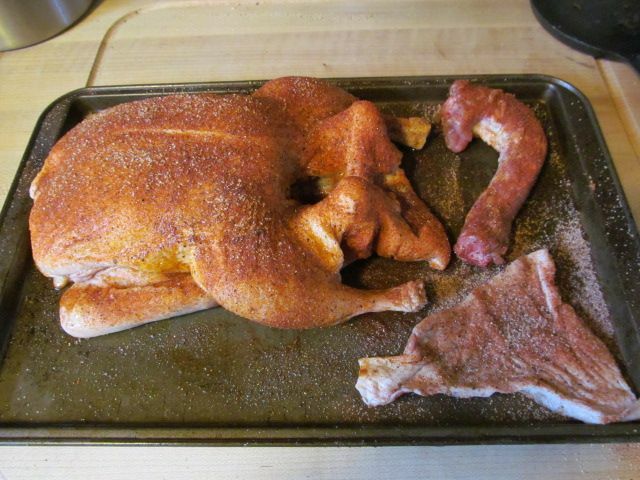 Then, I massaged olive oil all over the outside and sprinkled some Oakridge Game Bird and Chicken rub all over the skin and inside the body cavity. Just a quick note on the rub. I love the smell and flavors with this rub. Chilies, onion, and garlic are balanced perfectly with coriander and mustard powder. Good stuff. Just the right amount of sweet heat. I highly recommend with any game bird or your stand issue yardbird. 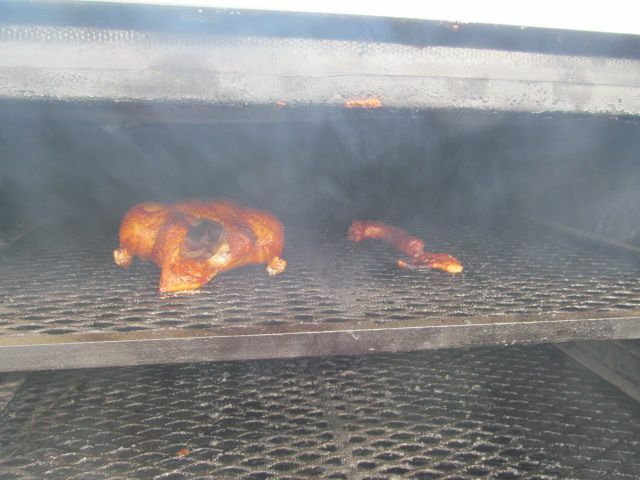 I brought the smoker to 350 F and placed some pecan and apple wood in the ash pan. Then the duck went on the top rack. Here it is after an hour on the smoker. The smell was intoxicating. 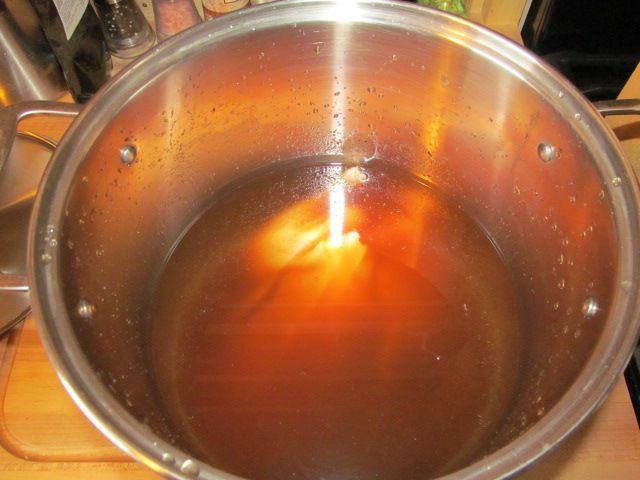 Heat to a simmer and reduce until it starts to get thick. I was going for Asian/American BBQ fusion. I brushed on the duck twice in the last 30 minutes of cook time so that the glaze could set. 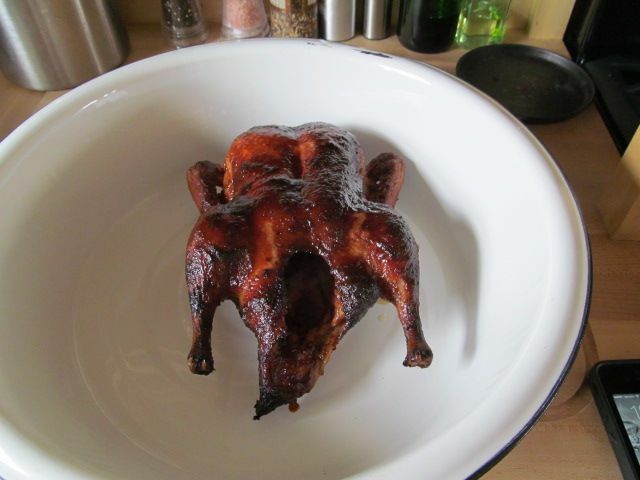 Then, I pulled the duck at 160 F and let rest for 15 minutes. How was it? The rub was great and paired nicely with the sauce. The meat was tender and juicy and not as fatty as people say duck can be. I think that cooking on an open rack allowed the fat to drain while cooking. The skin was not as crispy as I would have liked. The next time I will poke the skin liberally and scald in hot water. This is recommended to help promote crispy skin. My biggest issue was with the amount of meat. The duck was quite bony and did not yield as much meat as a chicken of the the same size would yield. This duck was only enough for two. If you had more people for dinner, you might be cooking a chicken. Overall, the taste was great. I am looking forward to smoking another one of our feathered friends. 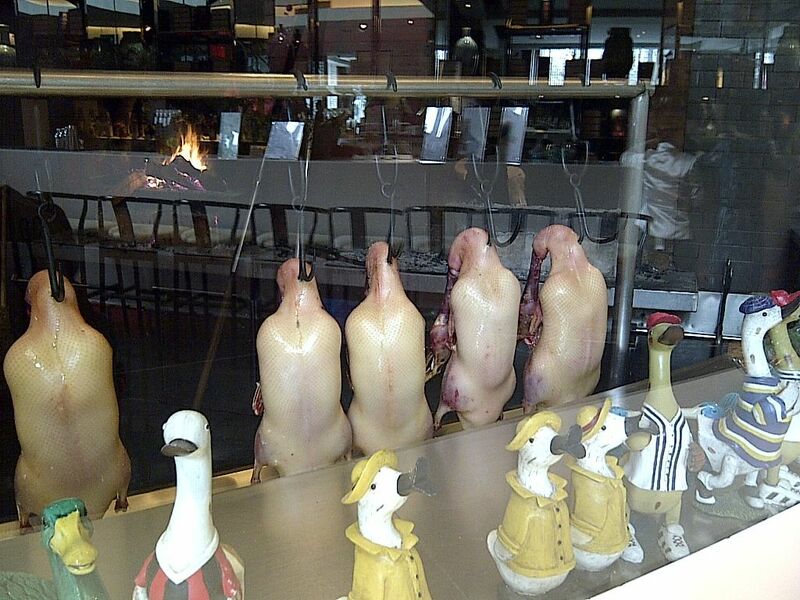 I would love to try your smoked duck. Duck is completely foreign to me. The couple of times I have had it was not a good experience. I am game to try again.Someday. Chilebrown, when cooked correctly, duck can be a very good dish. Maybe you should give it a try.